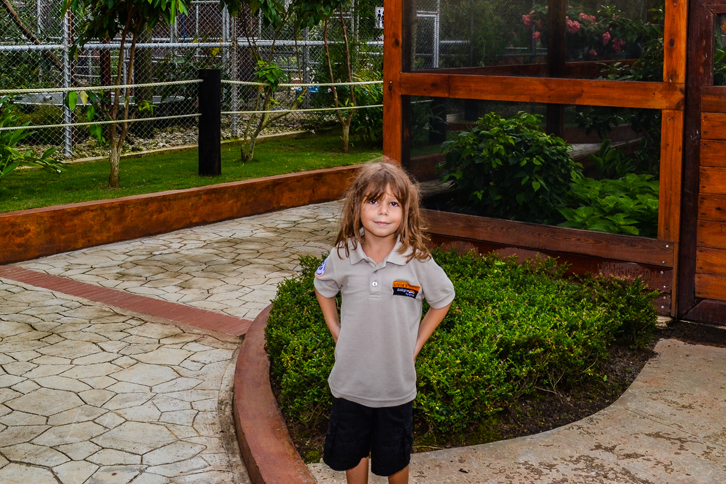 Last week, Safarick’s Zoologico invited Caribbean Panama Network for a pre-opening VIP tour of the zoo before their grand opening on October 20th. 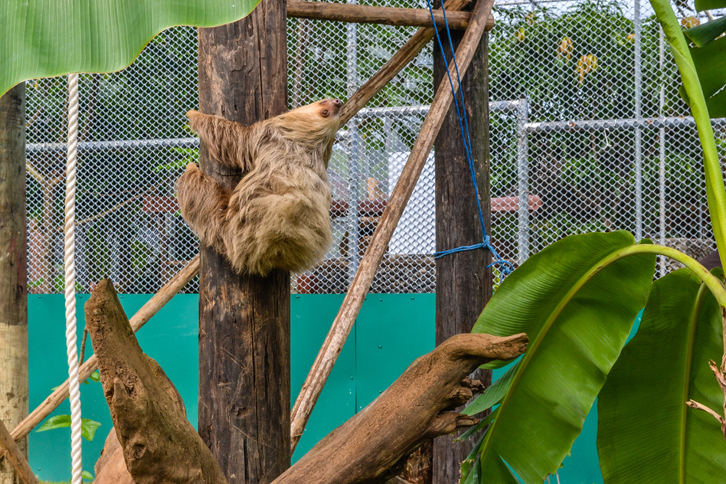 We have been watching the development of Safarick’s Zoo for the past 3 years and have visited the property a few times during construction and so we were very excited for the opportunity to see and experience the first zoo on the Caribbean Coast of Panama and get to know the amazing family that has built this sanctuary and their animals. We arrived at the Purificacao family home near the zoo late in the evening and were greeted by Antonio, Rita and their kids: 20-year-old Niko, 12-year-old Diago, and 5-year-old Jenna. The house was full of excited chatter in preparation for the first VIP tours the following day. Diago, Niko and their friends from school had been put to the task of guiding the visitors through each enclosure in the zoo so they were up late into the night studying about each animal and practicing their dialogue in English and Spanish. Quite impressive! Meanwhile, Antonio cooked a delicious dinner for all the house guests and Rita prepared the Safarick’s Zoo polo uniforms for everyone to wear the next day. Antonio’s brother Vic was also visiting from Canada to help out at the zoo’s snack bar. The house itself was quite a zoo! The following day we arrived early at Safarick’s Zoo for the grand tour. Nick, Diago and their friends all wore their brand new polos with the Safarick’s Zoo logo embroidered on the front. They excitedly greeted each guest and expertly answered questions about each animal. I, however, had my own special tour guide for the zoo: Antonio and Rita’s 5 year old daughter Jenna. No one on this earth could have been more excited about the grand opening of Safarick’s Zoo than Jenna! She wore her own polo uniform and just could not wait to show me all of her animal friends. The first stop was the spider monkey and capuchin monkey enclosure. The enclosures are tall and spacious with plenty of room for the monkeys to swing from tree to tree and also included ropes, “monkey bars” and a pool (hmm, come to think of it, these monkeys have a more entertaining place to live than I do!). Jenna knew each of the monkey’s names (she named them herself) and knew each of their quirks and unique personality. To her, they were not just animals, they were family! Her favorite monkey is Judy, who, like most of the animals, is part of Safarick’s Zoo’s Rescue & Rehabilitation Program. Jenna explained that Judy had been a rescue animal and was very sick and unhealthy when she first arrived, but now she is healthy and happy and thriving in her new home. Jenna then very excitedly led me to the open air sloth enclosure. She explained that there had been 2 sloths but one of them had recently escaped which was a very good thing because it means the sloth was healthy and strong enough to survive on its own in the jungle! We watched the remaining sloth climb very slowly back to his rancho but he was taking quite long so we moved on to the Butterfly Enclosure. The Butterfly Enclosure is a beautiful enclosed botanical garden filled with colorful tropical plants and flowers. As we walked through, we spotted many kinds of butterflies and even a giant dragonfly with bright blue wings. Jenna, of course, has this magical way with all of the animals and the butterflies just fluttered around her with one one of them even landing on her finger. And so the tour went on with my little tour guide, happily hopping around leading me from enclosure to enclosure to meet each of her animal friends including the coatis, deers, ducks and Thor the ocelot! The zoo itself is pristine, well-kept and the animals are very well taken care of in their spacious enclosures. To add to the experience, the grounds are beautifully landscaped and surrounded with tropical flowers and plants as well as tiki-style statues made from volcanic ash. Finally, Jenna led me to the final (and my favorite) part of the tour: the walk-through Aviary. It is Panama’s largest walk-through aviary and features a waterfall fountain and a large pool full of large Koi fish! There are peacocks walking around and you can see toucans, blue and yellow macaws and scarlet macaws up close as they fly from tree to tree and perch on the railings and fountains. It’s quite startling when one of these majestic birds fly right past your ear and land right in front of you! (Just as a warning, it’s a possibility that you get pooped on by one of these birds but I’ve been told that you *may* get a free treat from the snack bar if you provide proof of the incident). At the end of my tour, Jenna and I sat in the cafeteria and had sandwiches and cold drinks. We also sampled the chili dogs, fresh fruit smoothies and beaver tails that are featured on the menu. At the end of it all, I was pretty tired and full from all the food and was quite content sitting in the shade and watching the birds from the cafeteria. Jenna, however, was too excited to take a rest and spotted the next group of tourists to introduce her animal friends to. Overall, I had a great day Safarick’s Zoologico and I think it is a wonderful addition to the Caribbean coast of Panama. The Purificacao family has really poured their heart and soul into not just the project, but also the ongoing care and well-being of the animals that have been rescued and now live on-site. It was truly wonderful to see an attraction like this pop up in Maria Chiquita and I’m excited for the rest of the country to see this beautiful place. 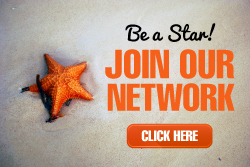 Safarick’s Zoo is only one hour away from Panama City and a fun adventure for the family! If you’re wondering if the kids will love it, just ask Jenna. If you’re lucky you may spot her there on weekends and I’m sure she’ll be happy to give you a tour! Click here for more information Safarick’s Zoo!